Whole egg powder. Cage-free eggs. It provides 13g of proteins per serving. Suitable for vegetarians. The flavour is very nice. I use it in many recipes including protein pancakes, meringue, puddings which makes a healthy and delicious breakfast or dessert. Awesome on a high protein diet or keto diet too!!! An excellent product to benefit from all the properties of whole egg. Really comfortable format, I decided to purchase it because it is just whole egg powder, without additives nor any other chemicals. Excellent nutritional supply from egg. The chocolate flavour is actually very nice, even though it makes a little foam when you shake it, you have to be careful not to overdo it. All the benefits from eggs in a single product, with a longer expiry date than the original ingredient and so many uses! A good product, great texture and dissolution, excellent choice for lactose and gluten intolerant people. So far I have tried the chocolate flavour and it is really good! 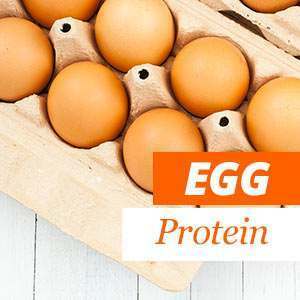 Buy Egg Proteins - All you need to know! Egg protein is a food with a high biological value, it is easily absorbed by the organism and it provides all the essential amino acids. Egg protein is efficiently used by the human body and it supplies all the essential amino acids, which are fundamental elements to build and maintain the muscle mass from the body. Egg white is the perfect food for anyone looking to take special care of their diet due to the good quality of its proteins and all its micronutrients, (complex B vitamins, specially niacin and folic acid, as well as potassium, sodium, selenium, magnesium, calcium and phosphorus), and the fact that it has no fat nor cholesterol as well as a very low carbs supply. Egg white is a really unique food which is mainly used when we want to gain muscle mass or lose weight, since it is pure protein, without any fats, carbs, nor cholesterol. Egg white protein powder has a high digestibility and it is efficiently used by the organism since it also has a high biological value (100). Where can I buy egg protein? Egg protein is the albumin or egg white from the eggs. It is a translucent, whitish and viscous liquid that protects the egg yolk and provides additional nutrients for the growth of embryo. Albumin is made of an 88% of water and a 12% of protein. The main protein from egg white is ovalbumin, which makes up a 54% of the protein content. It is followed by conallbumin, also called ovotransferrin which makes up a 13%, a 11% of ovomucoid and a 3.5% of lysozyme. It has no lactose nor carbohydrates and its fat content is very low. The biological quality of egg protein may vary depending on the manufacturing method. In the case of lyophilized egg protein, its biological value is 88 on average. Egg protein can improve the value of other protein sources, which is why it is often used to make protein blends. You can purchase other types of protein here. Egg protein is rich in BCAA's, tyrosine, cysteine, arginine, methionine, and phenylalanine. It has all the essential amino acids and provides nitrogen and sulfur, which are important elements for the metabolism. Its sulfur amino acids also help to keep the immune system healthy. Egg protein can also be consumed by those who suffer lactose intolerance or allergy to milk protein. Egg protein not only stimulates muscle growth, but it also prevents the accumulation of water under the skin. Egg protein is available in two different formats at our online HSN store. The first one is Evoegg, 100% egg albumin powder which is a fantastic source of proteins that is also low in fat. 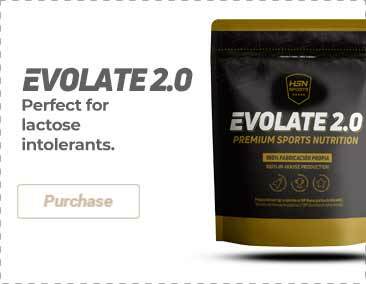 This product by HSNsports favors the growth and recovery of the muscles after high intensity workouts. It has a high percentage of BCAA's as well. You can purchase BCAA's at our online store. The second choice is the Egg White powder by HSNraw which will provide 26g of proteins per serving since it is made of dehydrated egg white. This product can be perfectly included in our everyday recipes. Low in sugars, without fats nor cholesterol and low in carbs. It also has essential amino acids in order to provide all the advantages of this protein for your organism. Eggs are an excellent natural source of proteins. Moreover, egg proteins are perfect for all those people who follow a ovo-lacto or vegetarian diet because it allows them to get the animal proteins they need for their bodies to function efficiently.